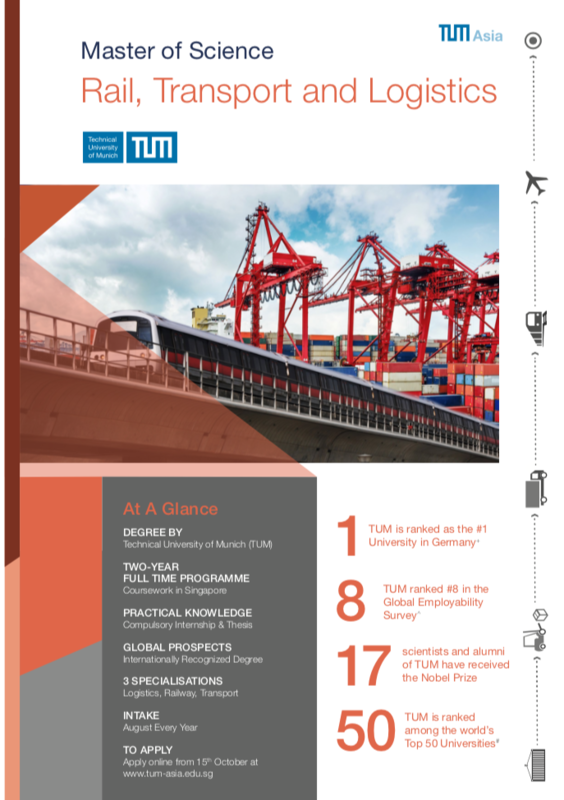 The Master of Science Programme in Rail, Transport and Logistics (RTL) conferred by Technische Universität München (Technical University of Munich, TUM) will provide graduates with the necessary knowledge and skills to successfully master the challenges faced in the areas of transportation, logistics and/or railway engineering. The student will learn how to analyze and assess the various traffic scenarios of the different transport modes and how to find appropriate solutions. Students will learn how to design and operate modern transport systems including integrated inter-modal management systems. Students are able to choose from 3 different specializations: Railway, Transport and Logistics in this Masters programme. The 2-year full-time programme aims to develop students into professionals in the dynamically growing market of railway, transport and logistics.. Upon the successful completion of the programme, the student will be awarded a Masters degree from TUM. In order to be eligible for the programme, you must have at least a Bachelor Degree** (completed in at least three years, depending on factors such as the rest of your education background) in any of the following fields: Civil Engineering, Transport Engineering, Electrical Engineering, Mechanical Engineering, Computer Science, Communications Engineering, Mathematics, Physical Science, Architecture, and Environmental Engineering (list is not exhaustive) with remarkable results. All coursework are conducted in English and students will be taught by German and Singaporean lecturers. Student-teacher ratio averages between 15:1 to 30:1. Only live teaching is conducted in all TUM Asia classes. All examinations will be written by the student him/herself, and examination results are released approximately 1-3 months after the examination. The Master of Science in Rail, Transport and Logistics degree is a 2-year full-time programme. Students must complete their coursework, 2-month internship and 6-month of Master Thesis writing to qualify for graduation. For students enrolled in AY1819 and before, please refer to the course structure here. This lesson will provide an overview of currently available mathematical modelling approaches and computed-based support for the solution of typical logistical decision problems. Students will learn how to model different problem types. A selected number of algorithms which solve the formal problem models will be introduced. This lesson enables the students to detect a known problem type in real life logistics, understand the limits of optimization and the value of decision support systems in logistics. This module will give an introduction to public transport planning. The module will start with a discussion about the advantages / disadvantages and the functional characteristics of transit modes and their capacity. The geometry and types of transit lines and transit networks are the following topics. How to organize transfers and increase the transit speed to improve the passenger convenience and the efficiency of the public transport network are also topics discussed in this module. The introduction to public transport scheduling is the last topic in this module. The objective of this module is to provide in-depth knowledge about the planning and organizing of public transport networks. This module comprises of two parts, mainly- Scientific paper writing and German language skills. The German language skills exercise aims to teach students the basics of German language, thereby providing them an insight into why German culture is part of World Heritage. Introduction into transportation science which involves analysis of empirical data and applying the most common methods in statistics used to analyse the data in practical applications. This module will introduce the interrelation between transport and the environment. Moreover, this module will represent the concept of a sustainable transportation system. Some strategies for archiving such sustainable transportation system will be worked out and discussed with the students. The second part of this module introduces the basic principles and concepts of an assessment and evaluation of transport and logistics systems. The assets and drawbacks of different assessment methods (Cost-benefit analysis, Multi criteria analysis, Balancing and Discussion Method, Environmental Impact Assessment, Ranking, Cost – Efficiency – Analyse etc.) will be introduced, including application areas and initial constraints of specific assessment procedures will be discussed. The module provides the basic knowledge about transport, mobility and urban planning. The main topics are: reasons for traffic, spatial and temporal traffic distribution, relationship between planning and design of the infrastructure and the assignment of functions in cities and conurbations, dependencies between supply and demand. The theory of travel demand modelling (4-steps-algorithm for travel demand estimation, etc.) is another important topic in this module. Students who choose ‘Logistics’: Students are required to complete all the Core Modules within their selected specialisation followed by a minimum of seven (7) Elective Modules in their specialisation. Students who choose ‘Railway’: Students are required to complete all the Core Modules within their selected specialisation followed by a minimum of five (5) Elective Modules in the Railway specialisation. Students who choose ‘Transport’: Students are required to complete all the Core Modules within their selected specialisation followed by six (6) Elective Modules in their specialisation. This module will introduce students to the field of Business Logistics in the global business world, as well as to the academic field of logistics research. Developing awareness for the real world relevance and complexity of Logistics and Supply Chain Management; introduce current definitions and meanings of Logistics. Get familiarity with the elementary “Logistics – Flow Management” concept and its practical applications at an introductory level. This module will introduce students to the field of supply chain management with its main challenges, theories and planning methods. The module will be organized as a series of lectures and exercise classes as well as in class case study discussions. This module gives an insight into the necessary components of airports and harbours and the planning processes for developing these sites. Besides that it offers several methods for operating airports and harbours. It covers aspects of the pre-planning process like environmental impacts that lead to the choice of location. All important components of airports and harbours will be discussed including the basics for designing them. The students will also receive in-depth knowledge about which operation and maintenance procedures are necessary to run airports and harbours successfully. This module is organised to provide an insight into the description of traffic flow with its numerous facets, coherencies and interdependencies as well as into urban traffic management and signal control. Basics: Variables of traffic flow, fundamental diagram, kinematic waves, stationary and momentary observation. Use of distributions for the modelling of delay and queuing processes. Introduction to traffic modelling. Microscopic modelling: kinematics and dynamics of driving, car-following-models, cellular engines. Macroscopic modelling: endogenous estimation of traffic relations. Urban traffic management and control: Basic concepts and system structures, general approach to signal control, design of signal plans, design of progressive signal systems. This module addresses the issues of logistics and supply chain management from the perspective of national and international consumer goods producers, wholesalers, retail chains and e-commerce companies from the food and non-food branded goods industries, fashion and luxury goods, home supplies etc. It shows the structures of logistics across the value chain by analysing each step from the producer to the consumer. Also, different possibilities of designing and integrating supply chains will be analysed. Throughout the module, case studies will be discussed to apply the theory in practice. The module provides an overview of the most convenient methods and procedures in the field of material flow and logistics planning. Starting with the actual collection of data and the subsequent profound analysis, the students learn how to use adequate tools and assessment methods in order to develop different planning alternatives. Furthermore, qualitative as well as quantitative evaluation methods are introduced and applied to help the students selecting the best option of the planning alternatives. The theoretical foundations are intensified by working on a complementary practical case study that is conducted in small groups. Understand the revolutionary new wave of business in the 21st century – Green Supply Chains–and its drivers and objectives. Learn how to go green in a holistic manner by applying green techniques which make companies ‘greener’ while increasing short and long term profits for the company. Explore innovative methodologies for the selected situations. Find out fatal mistakes that corporations and executives make when they go green. Discover the critical success factors for Green Supply Chain programs. Know the threats of and the reasons for increasing vulnerabilities of global and local supply chains. Analyse the causes of risks categories. Learn and effectively manage the assessments of SC risks. Become familiar with method toolbox of SCRM. Know relevant SC design principles to mitigate SC risks. Use risk mitigation and avoidance techniques to deepen your understanding von SCM. See the importance of collaboration and visibility in managing resilient SC. The aim and scope of this module are the special aspects of logistics and supply chain management in the health care industry. This module offers at first an introduction to the fundamentals of health care management. This industry is currently undergoing a phase of deregulation, which leads to privatization, professionalization and internationalization. This framework will be discussed with the help of several decisions situations. Furthermore students learn to understand the basic mechanisms of the health care value chain, develop a sound knowledge of appropriate tools and techniques how to management supply chain management activities and learn how to evaluate logistic processes in this special field of application. Special emphasis is put on strategic aspects of procurement and logistics in health care. Management games and case studies will be integrated in this module. The module covers the planning and design of safe, high efficient and sustainable road infrastructure linking cities, which needs the knowledge of the dynamic behaviour of the vehicles. Driver-Vehicle-Infrastructure interactions rule the geometrical design and the requirements for pavement works. The students will study and apply road planning strategies and tools by designing the road alignment for a new project (case study). This module covers also the construction and maintenance of road infrastructure as well as the environmental issues, e.g. noise emission. The module introduce students in specifics of global industrial manufacturers and suppliers and their main activities within their supply chain. The lessons explain basic process models, methods & technologies and illustrate how they can give business a competitive advantage. The students will learn how to use macro- and micro-simulation as a tool to assess traffic engineering and transport planning measures. This includes theoretical background of the methods implemented in the tools as well as extensive practical exercises in using the software and some advice how real world simulation projects can be structured. Additionally the students will have to gather their own data from the street to set up a realistic simulation of an own small example within the Singapore road network. This module introduces the general requirements and procedures for rail infrastructure planning based on the running behaviour and the performance of rail vehicles. The module is discussing the specific wheel-rail interface, the effective forces guiding the wheel sets (equivalent conicity), the determination and evaluation of track quality, the requirements for designing track alignment and layout, the tools to determine cant and cant deficiency, the procedures to design transition elements, the tilting train technology, the operational demands and respective track arrangements for passenger, freight and operational stations. Requirements to ensure passenger comfort and safety are introduced. This module covers the wheel-rail interaction, running behaviour in curves and straight track, propulsion systems diesel, electricity AC and DC, energy efficiency including regenerative braking, running gear and vehicle construction, including primary and secondary suspension devices, wheelsets, bogie frames and body shells relevant norms and design rules, tendering procedure and homologation process, safety issues as collision safety derailment safety, fire safety, environmental aspects as external and internal noise, particle emission, space consumption, reliability, availability, maintainability, diagnosis systems and their environment and benefit. This module provides an understanding of the forces acting between vehicle and track, the load distribution within the track superstructure into the substructure (Earthworks or civil structure) as well as the environmental impacts on the track performance, the respective general requirements for the design and the construction of rail infrastructure. In addition, this module will cover the rail track engineering required for the track design, the construction, the maintenance and the renewal of tracks for a variety of rail infrastructures (conventional and high speed). Conceptual design and structural performance of conventional and ballastless track systems will be discussed too. This module introduces to the students to train control and signalling systems. The benefits and challenges of techniques used will be analysed. Turnout, signals, and all track based equipment, facilities, electronic interlocking and train control systems will be covered too. Risk analysis and assessment of electronic systems and management of train scheduling and transport risk will be discussed. This module provides the requirements and procedures for ballastless track system design for high-speed and conventional mainline rail infrastructure, the special features of Metro and light rail systems, the train track interactions, the track lay-out and alignment for urban rail systems, the track cross section design including trackside equipment, the sources, propagation and effects of noise and vibrations, the measures to control and to counteract noise and vibration, the design of special floating slab tracks, the environmental impacts, the design of green tracks, the design and construction of tram-tracks, the embedded track systems. The module introduce students in specifics of global industrial manufacturers and suppliers and their main activities within their supply chain. Explain basic process models, methods & technologies and illustrate how they can give business a competitive advantage. This module introduces to the students the concepts of structure of the power system: generation, transportation and distribution and electricity consumption, typical power plant types including new renewable technologies, description of the transport, distribution and control philosophy, introduction to the electricity demand, especially due to new electronic services, fundamental terms of energy economy and electricity markets, smart grids. This module introduces students to the tools and methods of planning railway infrastructure using Computer Aided Design (CAD) software. Students will apply the requirements and rules set for railway planning to a student´s project by using a software package. The module will also introduce students to the Finite Element Method (FEM) for the modelling and analysis of track structures, subsystems and components used for the design and the evaluation of performance. Different approaches to creating Geometry models of these elements (specifically rail/sleeper) using AutoCAD and ANSYS will be explored. The basics of importing geometry files for FE analysis using ANSYS Workbench, performing simple analysis (modal, static structural), meshing methods (ICEM CFD, hexa, tetrahedron etc), compatibility of data transfer across different platforms will be explored. The module introduces the Multi-body simulation (MBS) as a tool to simulate and to analyse dynamic effects activated by a vehicle running along tracks equipped with different track geometry and track quality (rail roughness). It explains how to export FEM files to an MBS environment if advanced FEM-MBS co-simulation is applied, comparison of eigenfrequencies and eigenmodes between FEM and MBS platforms, construction of a simple railway track model, introduction to wheel-rail contact will be dealt with in this module. This module aims to improve the understanding of the general approach of traffic control and Intelligent Transportation Systems (ITS) in the urban and the motorway context; it introduces the principles of different systems, their technical approaches and it analysis ITS applications in urban, extra-urban and integrated systems. It explains the objectives, measures, methods and algorithms of implementing ITS. The module builds on “Basics of Traffic Flow and Traffic Control” and is closely related to the module “Transportation Modelling and Simulation Tools”. The intention of this module is to introduce students to the basics of tunnel works and geotechnical investigations that are conducted prior to the start of the project.This module is organized in two parts: beginning with the fundamentals of soil investigation, description and handling it introduces the basics of foundation and earth constructions relevant for traffic ways. In a second part the focus is on tunnelling methods and techniques. This module will give an introduction about designing urban roads in bigger cities. The module will start with a discussion about the advantages / disadvantages and the characteristics of different modes of transport. Urban areas in big cities or agglomerations have their particular challenges and needs of transport infrastructure. Besides the different aspects of land use, capacity of passenger transport and environmental issues, there is a need to keep the urban space in special consideration, as it is the area we live in. The objective of this module is to provide in-depth knowledge about the planning, designing and organizing of urban streets as spaces for living and find a way to organize transport in an efficient way for all modes and all mobility needs. Upon successful completion of the module, students are able to identify the key features of Intellectual Property (IP) as well as distinguish both registered and unregistered IP, the concept of Freedom-to-operate, five steps for fundamental inventions. Students further understand the procedure and strategies involved in drafting and prosecuting a patent, suitable methods for using patent information, meaning of patent infringement, important aspects of licensing. Upon successful completion of the modules, students are able to understand the investment environment of business entities in Singapore, the nature of bilateral and multilateral agreements, different facets of setting up a company- hiring policies for workforce, incorporating a company (shareholders, directors), overview of annual accounting requirements. They can also familiarize with the concept of LLP, the duties of a company director, his/her qualifications and responsibilities, formation of contracts and dispute resolution. More importantly, these concepts are taught to the students in the context of Singapore’s business landscape within its legal framework. Another key concept dealt with in this module is the rules and regulations of International Commercial Terms (Incoterms) as well as an introduction to legal systems in the world and the resolution strategies involved in labour issues. Upon successful completion of this module, students can assess the role that various elements of Industry 4.0 play to boost the productivity in the manufacturing sector worldwide. Students are able to describe the technical process as well as the associated automation present in Cyber Physical Systems (CPS). Students are also able to apply which types of production system related information exists and are relevant within which phase of the life cycle of the production system. Moreover, they are able to identify the current state of specification of general structure of Industry 4.0 component covering especially the structure of the management shell. After three semesters of coursework, all students have to complete a (minimum) two month internship with the industry or with an academic institution. It is required for the student to complete an internship related to his or her field of study. The 6-month long thesis work is the culmination of graduate work and an opportunity to apply the knowledge and skills that students have acquired through course work and internship. Through this guided learning experience, students work in collaboration with industry partners or other researchers on a project of mutual interest and may in some cases publish manuscripts resulting from the thesis.